For centuries, there have been tales of a vicious spiritual entity known only as "The Horror" at Number 50, Berkeley Square in London. The Horror has been dormant for years...that is, until now. Ben Jordan is contacted by the current owner of Number 50, to investigate the reappearance of the Horror. He soons finds he's not alone, as four other paranormal investigators join him on the case. In the past, the Horror has claimed several victims. Make sure you aren't the next one. "Ben Jordan's fourth case brings him to a house that is purportedly haunted -- and he intends to find out for sure. Lacks some of the energy of case 3 but is still an enjoyable (if short) continuation to the series." A much more grounded and typical paranormal setting for the 4th Ben Jordan game, which is not a bad thing. This is one of my favourite entries in the Ben Jordan series. The intro movie sets the foreboding atmosphere brilliantly; trapped within the confines of a haunted house/converted bookstore Ben and 5 other paranormal investigators have to discover the dark and terrible secrets embedded in number 50 Berkeley Square's walls. While this setting and plot device has been done before (the author acknowledges this with a couple of knowing nods in the game) it's still a captivating experience. The puzzles are simple; the characters have wonderful albeit predictable personalities (in fact this is when Ben teams up with Alice and Simon) but it's still a fun game overall and shouldn't be passed up by anybody. This was actually a really fun game with some good suspense, dialogue, and characters. Really, there was only one meh puzzle, but overall, a very nice addition to a well done series. My favorite so far. BJ gets better with each release. This time around theres nice sound effects that really add to the game. Theres more character animation when preforming certain actions. Great spooky atmosphere throughout and I did liked the music- well done! One thing- I hated using the phone in this game! Definitely a more classical haunted theme, this game does not exceed case 3, but definitely is still worthy of playing. Pros: Terrific sound, challenging puzzles, introduction and development of overall plot and characters. Cons: Not much music, the doors puzzle is very annoying, phone is also irritating, a bit too random at moments. The atmosphere on this game was amazing. Spooked the hell out of me. I really liked this game! It was scary and believable. For my money the best in the series (...to date anyway!) The new characters introduced were simple but completely believable - this was very well done. This is a good story and it hasn't been needlessly complicated or padded out just to make the game longer. I liked the more focused atmosphere achieved for this. It was brilliance to set it all in one house as it adds an aura of claustrophobia especially with you reach the intermittent doors puzzle. The music for this one was unfortunately lacking but sfx was ok.
Dialling phone numbers in game drove me nuts. Ahh, this was a great adventure game. Truly great, I got addicted to this one. I played it from 10 pm, to 3 am. I NEVER do that for any game, but this one did it for me. The characters and story were incredibly interesting and it was kind of spooky from time to time. The puzzles while not really hard, were logical and fun and thats all I care about in an adventure game. It's alright to have really hard puzzles, but I don't like illogical ones. This is getting a ten out of ten for me. People on here are saying in their comments that Ben Jordan 3 is the best. I'll try it next. Less good than the 3rd case (which is my favorite of all BJ series) but still better than the first two. Those characters who are into paranormal are interesting how they are put together because each of them sees the paranormal research under a different view. The ending is not great at all as the 3rd one but it's ok.
Not as good as BJ 3 but still a nice little game. Well done animations, nice sound effects and good dialogue. I also quite liked the puzzles even though they were so easy. The story was a bit disappointing though and the notepad-system is still as underdeveloped as before. The phone-GUI didn,t work well either and was quite annoying. Overall a good game for some hours enjoyment. Great game, especially liked the references to AGS games and community etc. Best out of the 4, some bits were actually quite scary lol. big thumbs up! I only have one question.......when do we get case 5?? another fantastic piece! so far, i have loved all 4 of your Ben Jordan games! this one actually had me a little scared at parts, lol. i really hope you make another soon! The game is just fantastic! Please write a "How to make a fantastic game" tutorial !!! This game is awesome, I've played all 4 of the Ben Jordan cases, and if you haven't...you definately should. Horror at number 50 was kinda sppoky also, there were times when i was scared to go in to a dark place or find out what was behind the door. If you have played 1 of the Ben Jordan cases then this one you wil LOVE, its the best!!! I am halfway through this title and it really has impressed me . The puzzles arn't overly complicated but that just keeps me going . I am attempting to learn the AGS system and consider this a great introductrion . I didnt enjoyed this game as much as the older Quest's of B.J did it misses alot of other feature's but this quest is good for Newbie's to Ben Jordan the game introduces B.J very well. It wasn't to hard I only got stuck once and that was just dumb of myself. But like I said great game! What a nice and concise little game. The investigatin story fits the format nicely. Some situations were a bit unlogical, though (such as when five investigators refuse to visit a hardware store in order to open a lock). I think that the scariness of the game could be enhanced by not having so cartoony sprites. I've been a huge fan of the Ben Jordan games since I first played the immaculate Skunk Ape. So obviously I was very excited when I came across this. However, for the first time ever I was dissapointed with a Ben Jordan game. 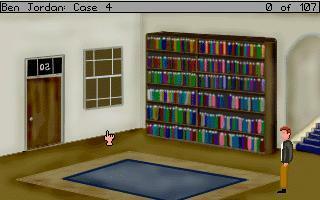 The main problem with Ben's fourth case is that there are far too few rooms to explore. The game attempts to achieve a specific atmosphere by restricting the areas there are to explore and basing the action more on the interaction between the several characters. (SPOILER: As the game progresses it becomes more and more clear that it is a pastiche of AGs classic 5 Days a Stranger but the opportunity for a truly witty parody of the game is wasted). SPOILER ENDS. Sadly, this makes the game seem less like an epic adventure and more like an inferior version of the game it is based on. It's not all bad. The game is still entertaining if a little short and some of the new characters are fun. The new addition of a phone is a nice idea, although you have to dial the numbers very quickly otherwise it attempts to dial before you've completed the the number. Perhaps a 'DIAL' button could be added in future games so the player could confirm when he has finished writing the number. Anyway, all in all Ben Jordan 4 was a worthy enough entry into the saga but dissapointing in comparison to the other three wonderful games. *twiching with crazy eyes* must Have MORE!!! I must say, I'm a total Ben Jordan fan. This game is an excellent contribution to the AGS community. If possible, make the next game (if there will be one) really, really long, full of witty interactions and alternate paths. Great job Francisco! These games are very entertaining. And BJ4 is no exception. It's got spooky moments, a fun plot, great characters. The music is superb, and the art is unique and consistent. Another great game from Grundislav. Play it now! A Fantastic game! WE want more more MORE! Great music great visuals. Timer in phone was undesirable though. Hope he makes Ben 5 longer and spookier! Great stuff. A little easy, and I would have liked more background to the story, but I still enjoyed it immensely. Keep them coming! I've played all the Ben Jordan games in order, and this is by far the best, though it actually was by far the easiest and felt very "short" to me. But, then again, I usually enjoy short, easy games with great characters than long games with obscure puzzles. Major kudos and I can't wait for the next installment. Another great Ben Jordan game. Please give us more, A must Play for all. An excellent game full of superb atmosphere and sound. The graphics suited the game perfectly and at no point did they seem out of place or rushed. All of the characters were very well fleshed out and they all fit the scenario. I would recommend this game to anyone wanted a spooky, atmospheric game. Whoo! First reply thingy! I'm downloadin.